Where all guests are members, and so they can enjoy many benefits: entertainment guaranteed, comfortable rooms, trained and helpful staff, and much more. We have an experience of over 11 years working in Tourism for backpackers at Hostel Backpackers club, rated as Peru best hostel for several years. Now we have started this new hostel with the atmosphere of a backpackers’, but the services of a hotel. Wide spaces, private and shared rooms, reading and TV rooms, a bar with Peru’s best Pisco, a games ground, a garden with a BBQ area, 24-hours round reception desk, Wifi across the whole house, breakfast, daily events and Spanish classes. We arrange transfers from/to the airport. Overall our stay was super nice in this hostel. Good quiet location close to the beach and on 10 minutes walking distance from parque Kennedy. 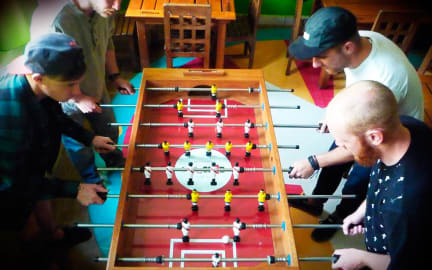 Staff is friendly and helpfull and the hostel is very clean and spacious. It would also be nice if there was wifi in the rooms. A really nice stay, comfortable bed, friendly staff, good breakfast and kitchen facilities. The only negative is that it was a bit quiet. If more people were booked in it would be a great atmosphere at the bar area I imagine. 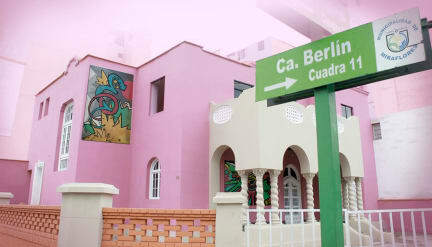 Still a really nice hostel Just outside the bussy part of Miraflores, 200 metres from the coast and the beautiful parks. Hostel is well organized, Venezuela Pedro speaks English and know what is going on in Lima. Good breakfast, 5 bathrooms with hot water, very clean, good beds. Actually nothing wrong with the place. The owners Cristian and Pedro check the place everyday and keep the standard high. Thanks for a fantastic time, will be back! Had a wonderful stay at this Hostel. The whole staff was friendly and helpful, the rooms and breakfast were also nice. The worst part was when I left my passport in the room when we left and the cleaner didn't found it. The best part was that Christian went back to the room to search everything, found it and immediately contacted me about it. Thanks again, and we will be back at the end of our trip! Lovely hostel for a good price! Friendly staff is the main reason to stay here. And also staff provides you with the information that you need. Location and security are good; lot of lockers. Generally clean. Sometimes at busy hours (morning or evening) the bathrooms are occupied, so there could be more. Nice terrace, lot of seating places and nice garden. All and all your money's worth. Breakfast is provided. Social hostal with a good location. Staff was very friendly, especially Cesar! However, there are only 4 bathrooms for the entire hostal... this was definitely not enough to cover all rooms. Nice hostel to meet some people. Staf is really nice and helpfull. There was a problem with the room and although it could not be fixed, the really tried to make it work. Breakfast is included, but basic. Hostel is in an old building, making it really noisy, matresses are old to, could use a fresh up.